Love, loss, and intrigue abound in this British western set in 1870s Yorkshire. Jessica Raine (Call the Midwife, Agatha Christie's Partners in Crime) stars as Annie Quaintain, a recently widowed mother forced to sell her house and possessions to pay off her late husband's debts. Penniless and shunned by society, Annie and her two children set out for Culverdale Valley, where an enormous railway viaduct is being built. 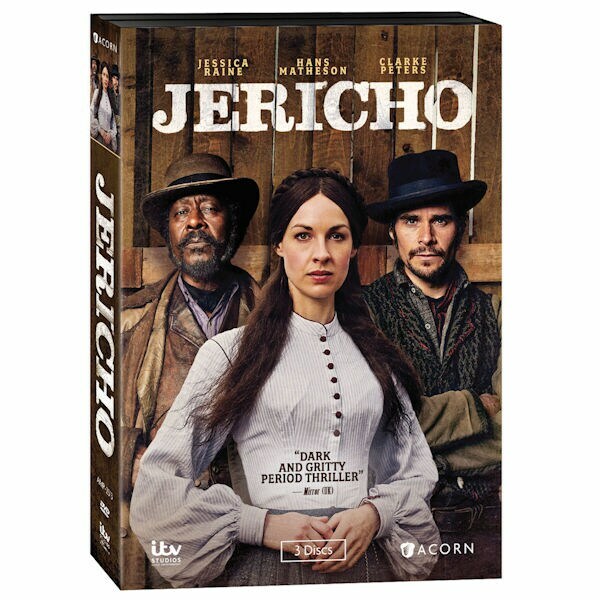 She sets up a lodging house in Jericho, a lawless shanty town full of rough and rowdy workers. Among the other new arrivals are Johnny Jackson (Hans Matheson, The Tudors), a kind and handsome Yorkshire native, and Ralph Coates (Clarke Peters, The Wire), an ambitious and enigmatic American. But in a town where people come to start afresh, it seems that everyone has something to hide--and a desperate crime soon threatens to shatter her family's chance at a new life. Gorgeously filmed, with first-rate production values and an outstanding cast, this thrilling drama also stars Sophie Thompson (Detectorists) and Jeany Spark (Wallander). 8 episodes on 3 discs, SDH. Starring Mark Addy, Dean Andrews, Lorraine Ashbourne, Elliot Barnes-Worrell, Lucy Black, Samuel Bottomley, Phil Cornwell, Natalie Gavin, Amy James-Kelly, Martina Laird, Paul Loughran, Tommy McDonnell, Hans Matheson, Clarke Peters, Jessica Raine, Daniel Rigby, Jeany Spark, Sophie Thompson, and Stephen Thompson.